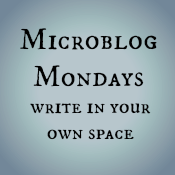 The #MicroblogMondays blogroll isn't a micro blogroll. That's both good - because it means a lot of people are doing it - and bad. It's bad because I feel the need to read (and maybe comment on) all the posts on the list. That's okay, they're short. But then I get curious about the person (if I don't know them), and want to read more. And then … well, you know how it goes. I need to be more disciplined, not so much with the writing – that’s coming easily - but with the reading of #MicroblogMondays posts. My solution? Rationing. PS. There's also a #MicroblogMondays post over at A Separate Life. I haven't commented much on your blogs, but know that I have been reading you for years. And hope to remedy the commenting thing. The problem is that there are blogs where the posts make me think, and think again, and I want to comment, but then life gets in the way, and I just don't get back to commenting. But the solution is not to for you to write more trivial posts, it is for me to sort out my commenitng time. :-) rightie-o. Ironing, here I come. Mina, this is a very late response, but I wanted to say how nice it is to hear that you've been reading for years. I can relate to your issues about commenting - sometimes the most thought-provoking posts don't get commented on because I'm still mulling them over. Oh, and I don't have a definitive method of rationing yet. Just that this week I'm not reading them all! Hopefully over the weeks I'll get to read everyone. Ha -- I went the opposite route and gorged myself all last night. I'm reading the last few now. I may ration some weeks, but there is something so nice knowing I'm sitting down for an hour or two on a Monday evening and reading and reading.